When I first saw this timber stack, it was relatively neat and ordered, like a storage area belonging to someone who keeps bits of timber for a purpose such as for use in a wood-burning stove. 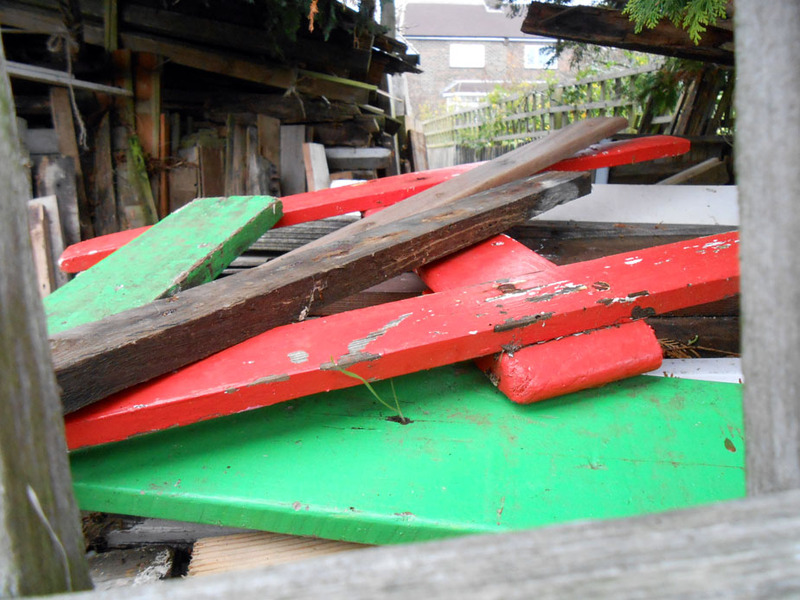 In three months it has deteriorated into a haphazard heap, which this week its owner has crowned with some colourful painted wood. Now I’m thinking, this hoard of timber is a case of “out of sight, out of mind”. Into which class of person do you fall? Do you throw things out unless they currently serve a useful purpose, or might do so in the identifiable future? Do you hoard things just in case they come in useful at a later, unspecified date? Do you dump stuff, treating it as “out of sight, out of mind”? LoL:-) That sounds like my husband, although he has got slightly more discerning about what he keeps these days, having had to clear out all the junk accumulated by a relative when she died. Of course that can happen. I sometimes throw out clothes and then wish I’d kept them as they suddenly have a use, even if for their fancy buttons or for using bits of them to make something new! If i think I can use it, I’ll keep it. Well done, managing to throw out some things. It can be quite therapeutic and emotionally cleansing doing a bit of de-cluttering. I’ve just filled up a charity bag with a couple of ill-fitting coats I’ll never wear and some books. Now I have some space in my wardrobe (not that it’s excessively well stocked) and my bookshelves aren’t looking quite so strained at the brackets! I do wonder at some of the perfectly reasonable stuff that gets thrown out. My old laptop computer surpassed all of my family’s expectations re its life. Mister kept saying, you need a new computer, and I kept repairing it and repairing it, but in the end it couldn’t accommodate some of the new but necessary updates and refused to load Windows anymore. I admit to still having not got rid of it, just in case … in case of “what” I’m not sure!